↑ "Scientists probe northern lights from all angles". Canadian Broadcasting Company - CBC. 22 October 2005. Archived from the original on 8 February 2007. 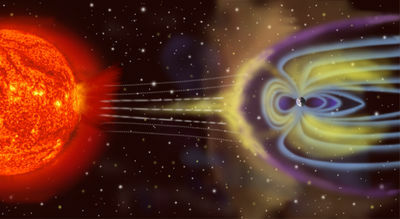 ↑ "Earth dodges magnetic storm". New Scientist. 24 June 1989. ↑ Gummow, R (2002). "GIC effects on pipeline corrosion and corrosion control systems". Journal of Atmospheric and Solar-Terrestrial Physics 64: 1755. doi:10.1016/S1364-6826(02)00125-6. ↑ Osella, A; Favetto, A; Lopez, E (1998). "Currents induced by geomagnetic storms on buried pipelines as a cause of corrosion". Journal of Applied Geophysics 38: 219. doi:10.1016/S0926-9851(97)00019-0. Ova stranica je zadnji put izmijenjena 21:53, 23 februar 2015.